I originally avoided this restaurant because of the distance from my apartment. However, recently, Urban Belly moved next to its sister restaurant, BellyQ, on Randolph Street. We decided to give it a try with a couple friends that frequent the restaurant. Upon walking in, you realize they split the restaurant into two. One side is the sit-down bellyQ restaurant, while the more relaxed atmosphere with communal tables belongs to Urban Belly. After ordering a slightly pricey bowl of noodles, you grab your own seat and wait for your order. The food portions are huge (I am talking about the noodle soups). The ramen is delicious and definitely higher class than most ramens in the city. But that does come at a price. The other dishes were above average, but not spectacular; however, the noodle soups singlehandedly elevated the rating... they are that good. And, for that reason, I decided on a 4-mile rating. Following graduation, my family and I decided to eat at Urban Belly. This time around, we knew to share multiple dishes. One of their specials of the week was the wagyu burger. This dish was made with a wagyu beef patty cooked to medium and topped with kimchee and their house sauce. It is served on an asian-bao-like bread (the white bread made with rice flour) and comes with a side of togarashi-topped french fries. First of all, the burger is a good-sized portion. It is too much for a lunch, unless you want to take a nap. My favorite part was the bun. They toast it to make the outside a little crisp, yet the bun retains its typical bao softness. The kimchee isn't too pungent and has just enough spice, which is mellowed out by the mayonnaise based sauce. The fries are piping hot and seasoned well. 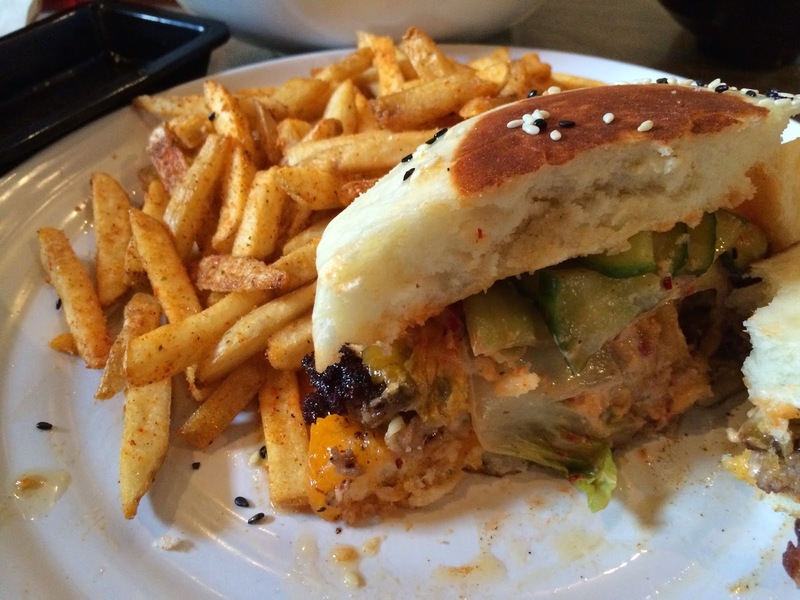 Hopefully this burger is still available when you visit Urban Belly! For an appetizer, one of my friends decided on the buffalo chicken dumplings for the table. One thing I noticed was the strange combinations in each of Urban belly's dumplings. I am glad he stuck with the buffalo chicken dumplings, which were made with their thai fried chicken, belly fire sauce, celery, and blue cheese. I really enjoyed these dumplings. There was a nice crisp to the wrapper and enough heat on the sauce to make you think twice. It is tricky because your mind says asian dumplings, but your tastebuds scream buffalo sauce. I highly suggest trying these. I will be back soon enough to try another one of their creations. Edamame may be the easiest appetizer to share. Here, they lightly steam them before tossing in a pepper and crushed fennel spice mixture. Nothing spectacular, but still tasty. Like I said, great to share. My girlfriend decided on the shrimp udon noodle because my fried rice dish (seen below) already had pork belly. This soup was made with the thicker Japanese udon noodle, half a dozen large shrimp, sliced fish cake, bok choy, and mushrooms. It was all swimming in a tasty shrimp broth. First, the bowl is MASSIVE. Without question, two people or more can share this one bowl. The noodles are the thick, chewier udon noodle which are amazing. They absorb just enough broth to allow the noodles to stand alone. The shrimp are huge, easily in the teen range per pound. I couldn't figure anything wrong with this soup, and that is why my rating is elevated despite some average items. Their signature noodle soup is the Urbanbelly Ramen. Our two friends both ordered this soup and gave me the opportunity to give it a try. This one starts with a saltier pork broth and is filled with classic ramen noodles, braised pork belly, mushrooms, and a soft-boiled egg. The first thing I noticed with this bowl was the amount of pork belly given. It is easily 1/2 lb of pork belly if not more. Each bowl came with at a minimum two six-inch slabs of pork belly. Wow. The noodles were cooked to the perfect consistency--not too mushy. The broth itself was delicious, but a little on the salty side. I highly recommend either noodle dishes and will definitely consider ordering this bowl next time! The dish I chose to share was the Phat rice. And it was a mistake. It was made up of their combination fried rice topped with ground chicken, fried pork belly, "Wagyu" short ribs, and pineapple. First of all, the dish was more expensive than all the others and half the amount of food. The so-called wagyu short ribs were as tough as leather. And, the rice takes significantly longer to make than the other dishes. Furthermore, the other components didn't really stand out as amazing to me. Honestly, there are several restaurants I could easily say have better fried rice. I don't recommend this dish at all. Stick with the noodles. This was my first time trying an Asian grape drink. Called Sac Sac, this juice actually has several halved grapes floating inside. It is super sweet and all of the grapes seem to settle at the bottom so be sure to shake well before drinking. - What to do: Order your meal at the cash register, walk around to the back of the register and grab a seat at the communal table. Sometimes it is more difficult to grab seats so be prepared to wait or grab a seat prior to ordering and have one person in your party order the food. - SHARE!!! The bowls of ramen are huge and easily enough for two people. They even give plenty of meat so no worries about sharing the protein. - Do try their dumplings! Delicious combinations. - Don't expect to make reservations unless you have 8 or more people. The tables are communal so try to snag one while your friend or family member orders the food. Seats are sometimes hard to come by.